Cycling is the excellent way to have much fun and when we are cycling with friends, the level of having fun turns into the double. The tandem bike is the greatest invention of the era that allows us to cycling together with friends. The Giordano Viaggio Tandem Road Bike is one of the familiar tandem bike that already achieved outstanding popularity from the tandem bike lovers. The Giordano Viaggio is a properly functioned tandem bike which parts are quality and high performance. It is originally built up with a custom designed frame that is looking durable and a serious performer. The experts originally recommend it for the beginners and the way the Giordano is composed the new riders will feel amazingly great with their first tandem bike. It is budget friendly and custom designed with 7005 aluminum that undoubtedly adds the superb stiffness into the construction. It almost fits with various size people and you can raise up up or down the seatpost as you need. On the both downtubes the Giordano separately adds two water bottle cages that help both riders to keep hydrated. Although the caliper brakes would be a little bit faded during the downhill ride and as the reason we have noticed a tendency for replacing the brakes. But if you usually do cycling over the flat roads, then these calipers brakes will work efficiently and don’t need to change this braking option. The 7005 aluminum alloy has the similarity with 6061 aluminum. These aluminums are made out from a mix of some great compounds like chromium, copper, iron, magnesium, titanium, aluminum and few others. The Giordano Viaggio has moulded these compounds to build up this larger frame that is incredibly durable and lightweight. This custom designed craftsmanship perfectly increases the superiority of the construction. To improve the riding comfortability it designed the 20 inch front frame and 16 inch rear that is a great measurement for a serious combination of both riders. The gearing system of the bike on a greater level as it is composed with superior level gearing components. You may know the Shimano that has the superiority for building up quality components for the road, mountain, tandem and many other varieties bikes. The Shimano components are trusted, quality and longevity the cycling performance and their products incredibly gained great feedbacks from the bicycle users. So to have the same experience for beginner tandem users the Giordano uses Shimano Claris front and Altus rear derailleurs. Moreover, these are also combined with Shimano integrated brake levers and shifters as the shifting and braking become easier and at the same time the Shimano derailleurs will provide an amazing efficiency. The bikers know how the long wheelset works for great controlling in the rough road. It’s not only useful for controlling, also it brings a more betterment in comfortability. Moreover, the alloy V rims are high profile that have extraordinary craftsmanship and won’t be damaged through your riding on rough roads. You would notice the off road bikes also use these rims to beat the lots of bumpy roads. —Custom designed frame with the extremely stiff 7005 aluminum. —Shimano components to improve the experience and simplify the control. —Relaxed riding position never impacts the neck and back. —No professional assembly required that means you can do that by yourself. —Brake calipers would need to place if you feel don’t happy with them. 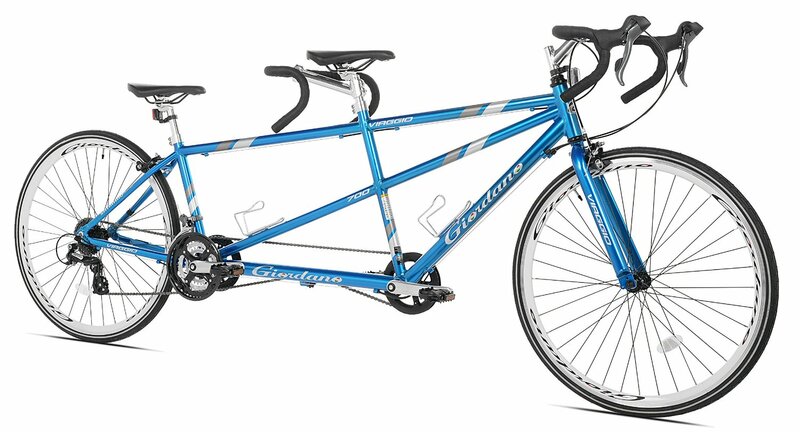 So if you are seeking for a rigid beginner tandem bike, then the Giordano Viaggio Tandem Road Bike is a price friendly & solid constructed bike for you. You can have a greater amusement in riding with your friends or other fellows. And in the same way you can also keep up enjoying the fun ride years after years. Even, because of the excellent geometry for riding position it will not impact your neck and back. So, that’s all what this tandem bike offers you.